Commercial Description:Introduced nationally in 1982, Bud Light is brewed with a malt and hops ratio different from Budweiser for a distinctively crisp taste with fewer calories. Commercial Description:This carefully crafted pilsner uses the finest ingredients and brewing techniques to ensure rich, full-bodied beer taste at only 96 calories. Whoa Nellie! The Bier Snob is going to review what? Yeah Man, I’m going to review Bud Light and Miller Lite. Well it’s going to be more of a head to head comparison than an actual review, I think? So how did I get here? Well let me tell you. It all started…. Actually I was bartending at our parish hall last weekend and the client asked if I wanted any of the leftovers. He was serving Bud Light, Miller Light and Yuengling. So I instently had one of those Eureka! Moments and thought why not. Let’s see which one of these light beers tastes better. Yes. that’s were I also got the Yuengling from that I reviewed a few day’s ago. I went to a local beer store to by a single bottle of Coors Light thinking I would make trio but I could not find the single bottles and I was not going to by a 6 pack. So here we are ready to review light brews. Can you feel the excitement? Both beers poured exactly the same; clear, very light straw with diminishing white heads. The noses are almost identical, which is just about nothing. There is a slightly maltier nose on the Miller Lite. Both have little to no real beer aromas with no discernable hops aromas at all. Wow, that is amazingly light. I know that that sounds corny but I did not realize how light this beer is. There are really no discernable beer flavors, well, not really. It is effervescent and somewhat refreshing but there is no real malt flavor at all. I assume that there are hops here and I guess that accounts for the dry finish but on the other hand there are no real beer flavors or malts to dry. I really did not detect any difference. Also here there are no real beer flavors and a dry finish. The only thing these beers have going for them is that there is nothing offensive there, since there are no real flavors there. I keep saying no real flavors but I guess there is, it is just really diminished from any pale pilsner or lager. It’s like these are training beers. It’s just a hint of what beer taste like. I’m going to have to go back and forth to see if there is a difference. I really thought that I would be able to detect some differences. I’m really surprised that these are so much alike. Straw, light grassy notes are coming out. There is a light malt flavor on that sip. I think as these warm a little there is some flavor coming out of them, faint as it is. I did not take a starting temp but they are now at 58 degrees. I suspect this is about as warm as they should be allowed to get. But I’m going to drive them a little further. Just for the pure enjoyment of it all. We are now at 59 degrees and it is becoming clearer that ML has more flavor than BL. That being said it’s not much more or for that matter not much flavor at all. I’m sorry I just can’t stop laughing as I’m typing this. Who wood a thunk it, the Bier Snob reviewing American Macro Light Beers. LOL! What a minute, no I’m sorry I thought BL was going to show some flavor at it warmed but I was mistaken. I can’t believe I’m going to say this. ML has a richer mouth feel. No, really it does. Oh, I actually have tears I’m laughing so hark. Lordy lordy, who’s got a 40. No, sorry I’m not reviewing a 40. Sorry, it is getting a little silly, OK, a lot silly. This is the most fun I’ve had trying to review a beer and it’s twice the fun since it’s twice the beer. We are at 62 degrees and they are both still drinkable. I guess I should explain that, they have not picked up any unpleasant flavors. They still don’t have any flavor but they have not picked up anything new. Well just in case you were wondering; the heads completely disappeared almost before I starting drinking them and of course there is no lacing. Ok, here are the final tastes. We are at 66 degrees and I must say I am very apprehensive in finishing these glasses. Well they are both picking up some unpleasantness; nothing really harsh but there is an off taste to both of them that was not there earlier. I believe I have a winner. Bud Light or Miller Lite? That is the question. 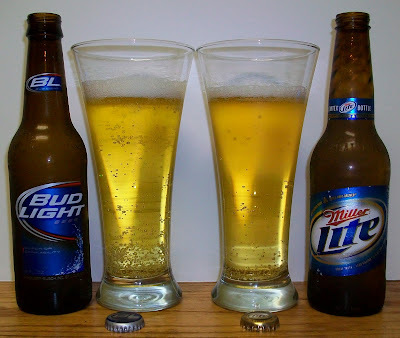 Yes, the official word from the Bier Snob is that Miller Lite is a better tasting beer than Bud Light. This was a hoot!. I really had a blast doing this. I have never sat down and drank a light beer before. I’m sure I must have had one from time to time but that was on draft at a party or just to test the lines after taping a keg at the hall. This really was my first time to sit down and actually drink a light beer. No I am not going to give these a letter grade. What struck me is that these seem to be starter beers. I mean that with no disrespect to the light beer drinkers. These beers a really just a shadow of even your typical Pilsner Lager. They have just a hint of the hops and malts of the regular brews. It’s like training wheels for beer. I cannot in all honesty recommend either of these beers. But hay if that’s your thing then go for it. The only thing I can say is that Miller Lite does have a little more flavor than Bud Light. So have fun and let me know when your ready to take off those training wheels. It was a hoot Missy. We'll have to had these to our next beer tasting at your house. I can't believe this.. I am still in shock.. is your body & mind recover for this yet? No wonder you had such a bad headach yesterday! That should teach you! Hi John. Stumbled upon this website looking for my next beer to buy (I have to be picky, the cheapest a good beer comes in NYC is $10 for a 6-pack). After looking through more.. enjoyable beers, I saw this one and had to laugh, as I've never seen a better term for these as "training wheels for beer." As a former poor college student, its unfortunate that the beer I consumed the most was Keystone Light. Its just so damn cheap. Getting Bud light at a party was like a gift. It's funny to me that from two completely different perspectives and situations, something like Bud light can elicit such a laughable reaction from yourself and a relief from someone like me, thankful I wouldn't be drinking keystone all night. I've actually found the best balance of acceptable taste versus price (on a college budget) is Coor's light, though when I can afford it, I always aimed higher. As a grad student, I don't subject myself to these "starter beers" when I can. Anyway thanks for the reviews! That's funny I was actually looking or a Coors light to add to this but could not find a single bottle at the store and was not going to by a 6pack.